We always offer a simple egg dish (I adore this Spinach and Cheese Strata recipe from Smitten Kitchen) as well as other foods that I know little ones will love. 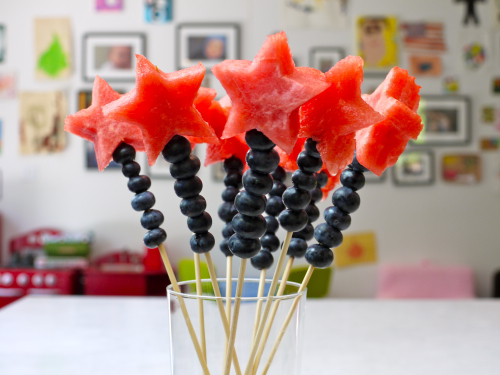 These healthy very berry muffins from Weelicious are always a hit and you can never go wrong with serving fruit, like a big bowl of berries or these adorable watermelon star wands! Although I try to have as much done as possible beforehand, there are always last minute things to do! 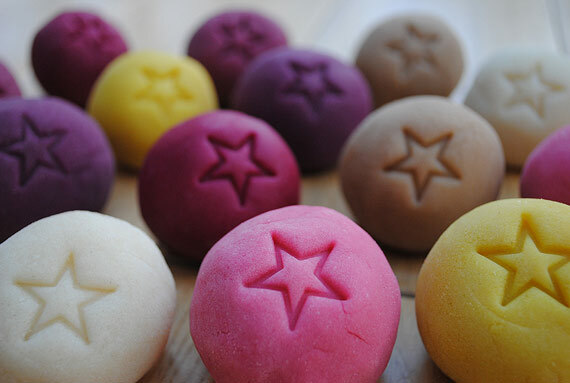 Get your little ones (and their friends) involved and chances are, they will enjoy the experience. Little M loves to help set the table, dry fruit and veggies and assist me with the cooking. Set the table! 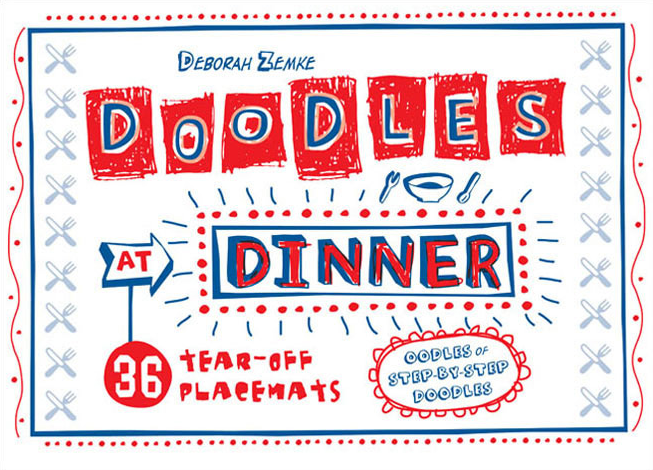 Make the meal more fun for toddlers by providing little activities. 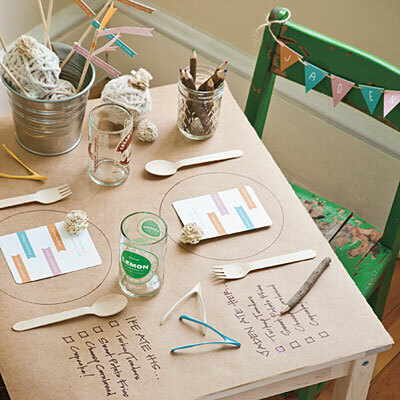 We love to put out paper placemats, like these, and mason jars filled with crayons. Or if you want to make a really big impression, you can cover the table in kraft paper and let the kids (and adults) go crazy. 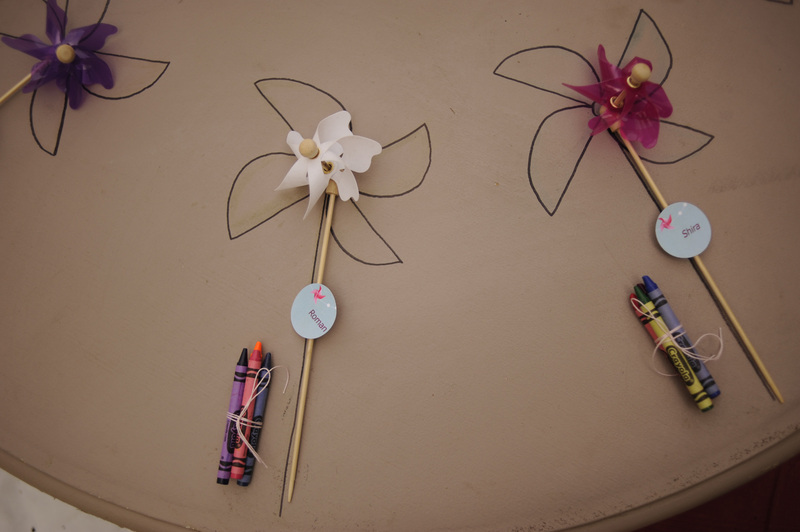 Use crayons, markers, pencils or pinwheels (like they did at this adorable party from The Sweetest Occasion) for decoration – there are so many possibilities. Consider having a little gift bag for the kids after the meal, like a small book, some blocks, bubbles or even homemade play dough (recipe here). Not only will they be excited about their new toy, but will most likely want to play with it immediately, which will give the adults time to enjoy coffee and some quiet conversation! Photos by Southern Living, Weelicious, Little Partners, The Sweetest Occasion and Minieco. I’m a huge fan of covering the table with craft paper and setting out plastic cups with crayons for the kids (and, um, me!) to draw on. Great ideas! That is so cute! seriously good stuff here. You are a professional for sure 🙂 Here’s my question, though. (two actually) 1) How do you get your house clean enough to have folks over and 2) Where do you find the time? I can usually get past #1, but 2 gets me everytime 😦 Want to entertain more, so I appreciate the inspiration I find here. Appreciate you coming by for the poptails. (those might work at a brunch, too 😉 mimosa poptail–what do you think?) Always glad to see you at food for fun. Thank you for your kind words! 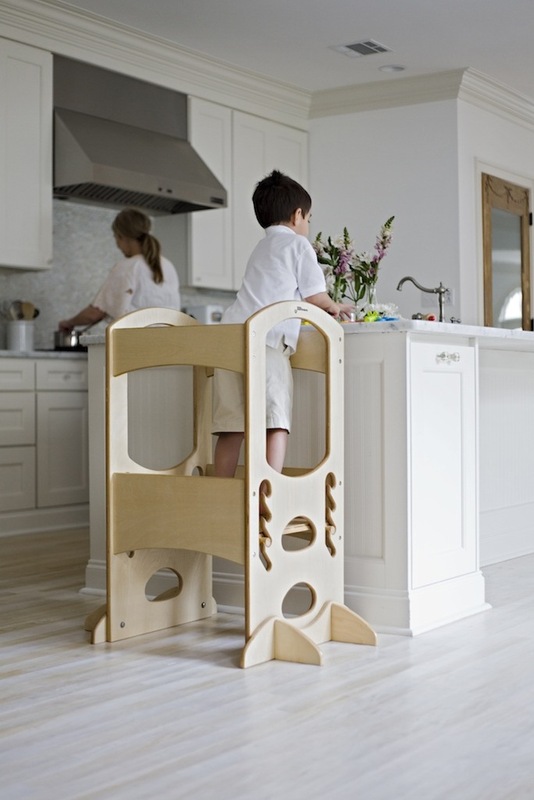 Well, our house is probably never ‘spotless’ but that’s the way it goes when you have a toddler at home! Having people over definitely forces us to clean up and get organized (although it usually happens in a frantic rush that morning). As for time, that’s a tricky one, since there never does seem to be enough time to do anything these days! I really like to make stuff that I can prepare in advance – some good inspiration for recipes here: http://smittenkitchen.com/blog/2009/12/how-to-host-brunch-and-still-sleep-in/ – and then just assemble/put in the oven right before everyone arrives. And I would LOVE to see a recipe for mimosa poptails, sounds amazing! It’s not the recipes and cooking that stump me so much as I have a good handle on throwing things together, but it’s carving out time in the schedule and finding times when the folks we want over have time as well. Love the idea of calling friends over last-minute, etc, but it seems things have to be scheduled out. Do you find the same? Appreciate your words of wisdom. Am always so impressed with everything you do. Thank you so much, that’s really nice of you to say! I must admit, we are not really last minute entertainers anymore. It’s all planned out WAY in advance and we make it a point to put it on the calendar so we don’t forget. It’s helpful, especially for getting together with friends who have kids – since their schedules tend to be just as busy! So I guess it’s not exactly impromptu, but still pretty fun. and read the blog post for Delicious Homemade Bread from April 20/14. Each recipe prepares enough dough for 2-3 loaves, and it can be baked after only a few hours OR refrigerated for up to 3 weeks for a warm loaf of homemade bread whenever the urge strikes… especially for breakfast or brunch!